Rachael Mew is loving life working for MedSailors in Croatia. She trained with UKSA, doing her Watersports Instructor Training then her Yachtmaster course, plus RYA Cruising Instructor. 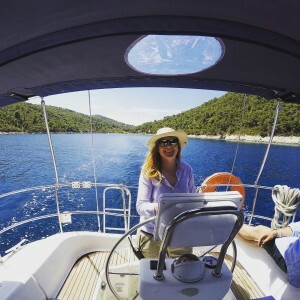 She then worked for UKSA as a watersports instructor but yachting was where she really wanted to be, and the offer of a job in sunny and beautiful Croatia couldn’t be resisted! She moved out there in April and is working as a skipper. She said: “Working for Medsailors is fantastic. Every week I get a new set of guests on my 46ft yacht and I take them round to different islands in the Adriatic. My day to day life is really relaxed. I get up in the mornings and make breakfast for the guests at 9am. We leave port at about 10.30am and make our way over to the next island for the night. I serve lunch consisting of salads, meats, gnocchi dishes and fish, either at a beautiful bay or just bobbing mid sea.